On Friday 6 and Saturday 7 April the weather was not good and we spent several relaxing days at the campsite watching TV, reading and working on the laptop. On the afternoon of Saturday 7 April, the weather had improved and we decided that we would take a drive along the northern banks of the River Clyde through and beyond Dumbarton and Helensburgh. We then continued on the A814 along the eastern shores of Gare Loch to Garelochhead. Just before reaching Garlochhead we passed the Royal Naval Scottish Headquarters and nuclear submarine base at Faslane. This very large naval base with its large accommodation blocks and other buildings extends along the loch side for a considerable distance. It is effectively a small “town” in its own right with 3,000 navy personnel, 800 of their families and 4,000 civilian personnel. However, it does not really fit in with the pleasant Loch and mountain scenery location. When we reached the aptly named Garelochhead at the northern head of Gare Loch we turned south down the opposite, western, shore of the Loch on the B883. This road offered lovely sea views back across Gare Loch to the shore which we had just driven along. We stopped for a while at Kilcreggan at the southern end of the Rosneath Peninsula. The Kilcreggan pier gave a wonderful vista across the wide expanse of the Clyde estuary to the towns of Gourock and Greenock on the southern bank of the Clyde. 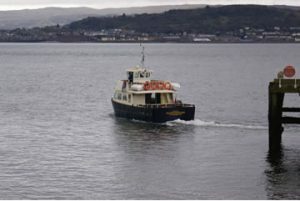 We watched the small passenger ferry crossing from Greenock and docking at the pier. As the B883 ended at Coulport a little further along the eastern shore of Loch Long we decided to retrace our journey northwards along the western shore of Gare Loch. At Garelochhead we turned north onto the A814 which soon joined the eastern shore of Loch Long. This road was narrow but set well above the Loch and gave lovely views over the Loch to its lonely, heavily forested shore. Loch Long is a narrow sea Loch with only a few houses along its length. At the northern head of Loch Long at Arrochar, after a brief stop to take some photos, we turned east on the A83 to Tarbet and the junction with the main A82. 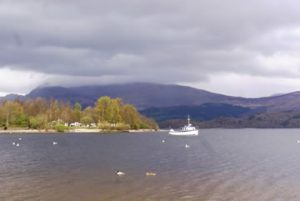 On Sunday 8 April we spent a day visiting Loch Katrine and the north eastern shores of Loch Lomond at Inversnaid. To reach Inversnaid involved driving east on the A811 from Drymen before turning north on the A8 to Aberfoyle. We then took the B829 north west past Loch Ard and Loch Chon. The road became increasing narrow and lonely, eventually becoming a single track road which passed Loch Arklet and the Inversnaid bunkhouse; a beautiful conversion of a former church. After passing through the village of Inversnaid the road terminated at the Inversnaid Hotel on the north eastern shore of Loch Lomond. I don’t think that this rather challenging road was worth the effort of driving it, particularly the final precipitous hairpin bend stage down to the Inversnaid Hotel. This very large hotel has its own landing stage and is more easily reached by the regular ferry from Tarbet and Inveruglas on the western side of the Loch. Adjacent to the hotel are the Arklet Falls which are fed by Loch Arklet above. There is also a display board about William Wordworth’s poem “To the Highland Girl of Inversnaid”. We parked near the hotel and walked north along the shore of Loch Lomond towards Rob Roy’s cave. The signed path makes up a section of the West Highland Way, and we passed a number of walkers travelling both ways. We found a grassy spot overlooking the loch to enjoy a pleasant picnic. On the drive back from Inversnaid we made a short detour to visit the pier at Stronachlachar at western end of the beautiful Loch Katrine. Loch Katrine was much beloved by the author Sir Walter Scott. We had thought about a trip on the restored steamer “SS Sir Walter Scott” but the weather that day was not really suitable as it was rather cloudy and misty. There is a very pleasant café at the landing stage at the Stronachlachar. In addition there are rowing boats available for hire at the pier. 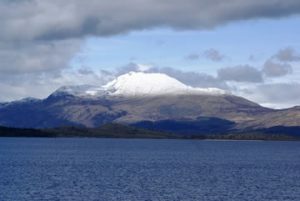 On Monday 10 April we drove along the western shore of Loch Lomond on the A82. We visited the village of Luss. Luss is a rather busy and touristy village just off the A82. The village also gained fame as the outdoor location of the Scottish TV series, “Take the High Road”. Loch cruises and ferries depart from Luss, and in addition there are some pleasant walking routes in the area. There is a very large Pay and Display car park and a small beach with a pier and lovely views over Loch Lomond. There is another Camping and Caravanning Club site on the shores of the Loch. We stayed there in our caravan many years ago, and its proximity to the A82 make it a popular stop for those heading north into Highlands. The site is worthy of longer stays but it is not as peaceful as the sites on the eastern shore. The village of Luss has a number of pubs but not much else as far as I saw on our brief visit. After visiting Luss we continued northwards to Tarbet from where we took a cruise on the Northern end of Loch Lomond with “Cruise Loch Lomond”. We took their “Rob Roy Cruise” along the northern shores of the Loch. The weather was rather cloudy and showery but we were impressed that the cruise still ran even though we were the only two passengers. We were still given a Camping and Caravanning Club discount of £1.50 on each of our fares, and the young lady crew member even served us our complimentary liqueur coffee with rum on the upper viewing deck. The boat’s captain gave an interesting and amusing commentary during the cruise. The other main cruise company on Loch Lomond is “Sweeney’s Cruises” who operate from a quay on the riverside in the centre of Balloch. On the afternoon of Tuesday 11 April we took the one hour cruise but I really would not recommend it. The fact that the boat had to first sail out of the River Leven into the Loch meant that it didn’t get very far up the Loch at all. This cruise did, however, give some splendid views northward to the mountains which were capped with snow. We had hoped to take the two hour cruise but Sweeney’s cancelled it due to what they considered poor weather and the supposedly resultant low demand. All in all we felt that for value for money and friendliness, “Sweeney’s” cruise compared very unfavourably with the one we had taken with “Cruise Loch Lomond”. Balloch Country Park at the eastern end of Balloch stretches along the shores of Loch Lomond and is well worth a visit, particularly on a sunny day. The Park is owned by Glasgow Corporation and managed on its behalf by Dumbarton Council. The 18th Century Gothic mansion houses a visitor centre which describes the history of the park. The extensive gardens which make up the Park have been extensively restored to show off the plants and trees which were collected from all around the world. There are a number of marked walks of varying lengths. 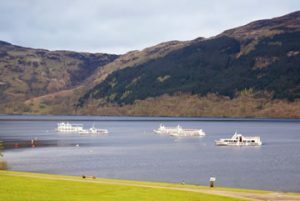 The park makes full use of its location at the southern tip of Loch Lomond with superb northward views. It is an excellent place for whiling away a sunny afternoon with a picnic on the extensive lawns. We visited the park on the way back to the campsite on the evening of Tuesday 11 April and enjoyed the lovely views.